This of course, is the $8 billion successor to the famous Hubble telescope. “So far, everything — knock on wood — is going quite well,” says Bill Ochs, the telescope’s project manager at Goddard Space Flight Center in Maryland. The massive mirror is being built in a facility that’s essentially a giant, ultra-clean gymnasium. NPR can’t go inside for risk of contamination, but I meet crew chief Dave Sime at an observation deck where we can see the mirror below. Sime works for the contractor Harris Corp., and he’s normally in there assembling it. When he is, he has to wear a white suit that covers every inch of his body. For months now, he’s been working 10-hour shifts. 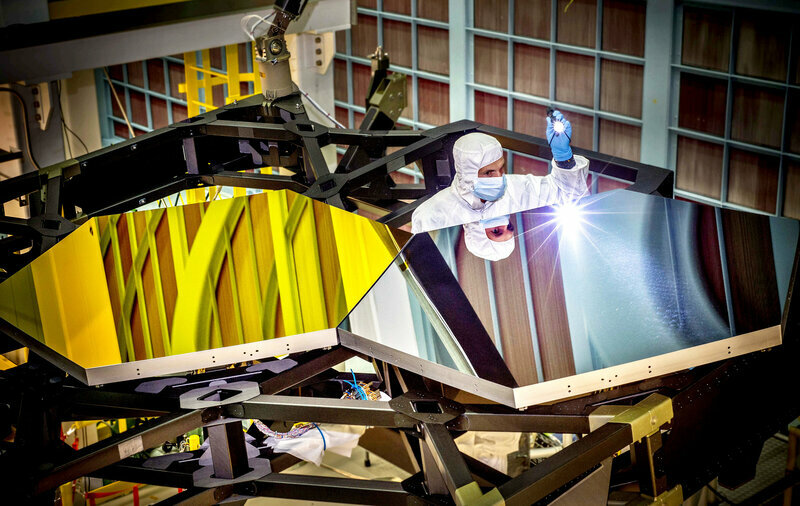 His job is to take 18 hexagonal mirror segments, each about the size of a coffee table, and attach them to the telescope’s cobweb frame using glue and screws. When everything is done, the mirror will look like a giant, golden satellite dish, two stories high. The assembly process is precise, and more difficult than even an Ikea wardrobe. Sime points to a table covered in books filled with instructions: “Each one of those notebooks is for one mirror,” he says. Everything has to be by the book. 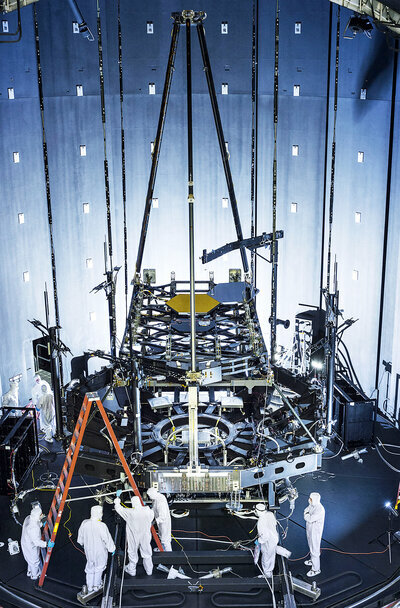 The Webb telescope will be one of the most expensive things NASA has ever built. Its segmented mirror is so big that, once it’s in space, it will have to unfold like an elaborate piece of origami. And to make observations, it will need to be a million miles from Earth, so far that no astronauts could fix it if it breaks. But the Webb will be able to do things no other telescope can. It is designed to capture light from the first stars and galaxies, which has been traveling billions of years across the universe to reach our solar system. No specific date set yet Robert. What month in 2018? Can’t wait for it’s discouveries! Climate Change May Be The Reason We Don’t Hear From E.T.